With a cult following on You Tube, a huge library of make-up tutorials and their own line of make-up brushes, it seems that the beautiful Pixiwoo sisters Sam and Nic can do no wrong. I have, and love, many of their brushes. They are excellent quality, and really do help you to apply your make-up flawlessly. I purchase mine from the well known online store iherb, which as it happens, is currently offering Real Techniques brushes at 20% off until the 21st May! I absolutely jumped at the chance to try their newly released make-up kits , so as soon as I received the email that they were available to purchase, it was on like Donky Kong!! Thankfully, Real Techniques were offering worldwide shipping, and I opted for the express delivery option, (a very reasonable $12.01) which saw my order confirmed, shipped and delivered to Australia in seven days. Nice. Do bear in mind it is an American company, and prices on the website are in US dollars. My total order, including shipping came to just over $69.00AU for the 2 palettes. There are two kits available...Modern Natural, perfect for a more natural daytime look, and Night Owl, your smokey, evening appropriate shades. Each palette contains three shimmer eyeshadows, one matte eyeshadow, one gel eyeliner, one cream highlight, one powder blush, and two lip glosses. Do keep in mind my focus with this post is mainly on swatches, and initial impressions only. This is by no means a full review. Real Techniques "Modern Natural" Make-up Kit. The kits are housed in sturdy cardboard packaging embossed with the Real Techniques logo. Inside, the products are contained in a plastic tray. The lid has clear, pliable perspex lid which has a magnetic closure. At first glance, the packaging is probably not particularly enticing, but it is functional. Fine by me. 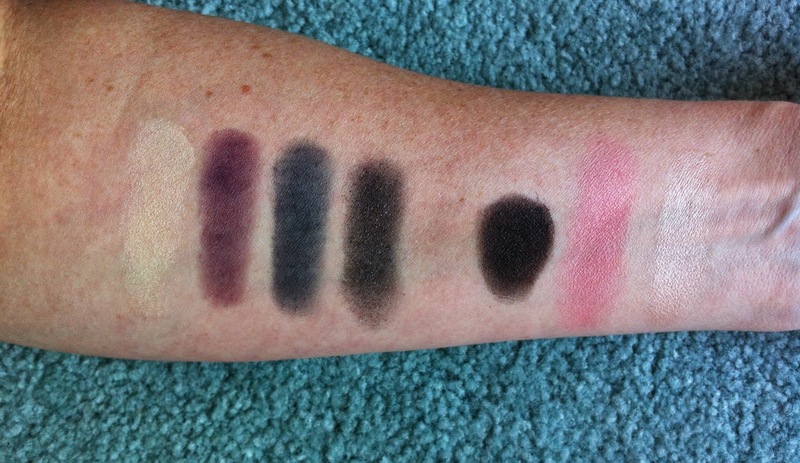 Swatches are in the order they appear in the palette. To touch, all of the shades in this palette feel smooth and silky and have good colour pay-off. 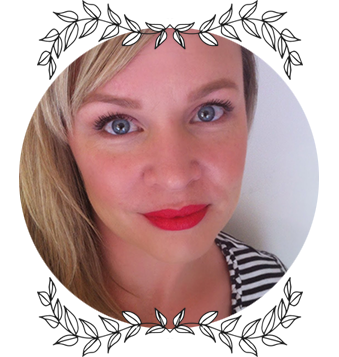 The blush initially felt a little powdery, but adheres to the skin well and is easy to blend...and such a pretty peachy pink satin/matte blush. The cream highlight ( far right ), reminds me of The Balm's Mary-Loumanizer...very much. It feels soft, creamy and easy to blend. I am really looking forward to getting this on ma face! The gel liner is also soft and creamy, and a lovely warm chocolate brown. I obviously can't comment on application, wear and longevity, however I am really looking forward to using this palette! There are two shades of lipgloss in the Modern Natural palette. A shimmery gold with a fine glitter, and a very sheer pink/peach, which on the lips really looks like a clear gloss. They are very small tubes, and it is a little hard to get a decent amount of product out...I had to dip the applicator in several times to get enough gloss to cover my lips. The gloss itself does feel nice on the lips, and even a sheer gloss compliments the overall theme of the palette nicely. Real Techniques "Night Owl" Make-up Kit. Some of these deeper shades lost a little intensity on the skin, the purple/plum, and the blue shades definitely taking on a more muted tone... there is very little shimmer to the plum at all. The pale gold highlight on the far left is gorgeous. 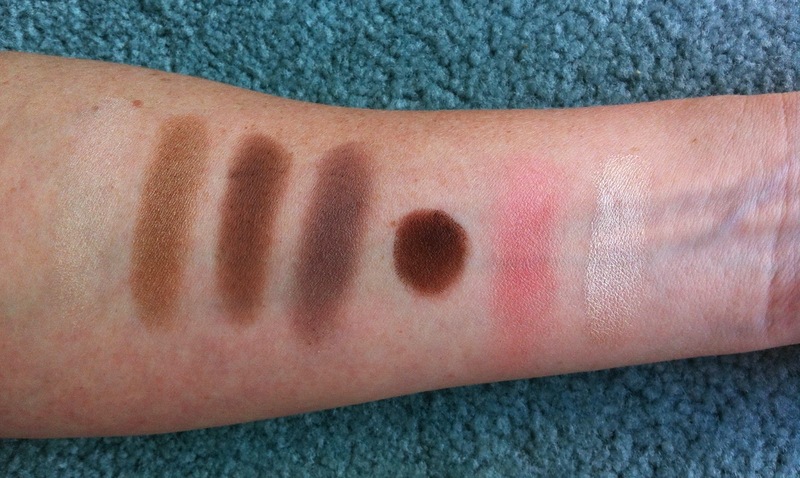 To my eyes, the cream highlight is the same in both palettes ( do correct me if I am wrong ). How gorgeous is this blush looking? Very silky and smooth, and such a gorgeous sheen. What I would call a lovely rosey pink. The two glosses in the Night Owl palette pack a little more punch, as you can see above. The red is highly pigmented and beautiful. 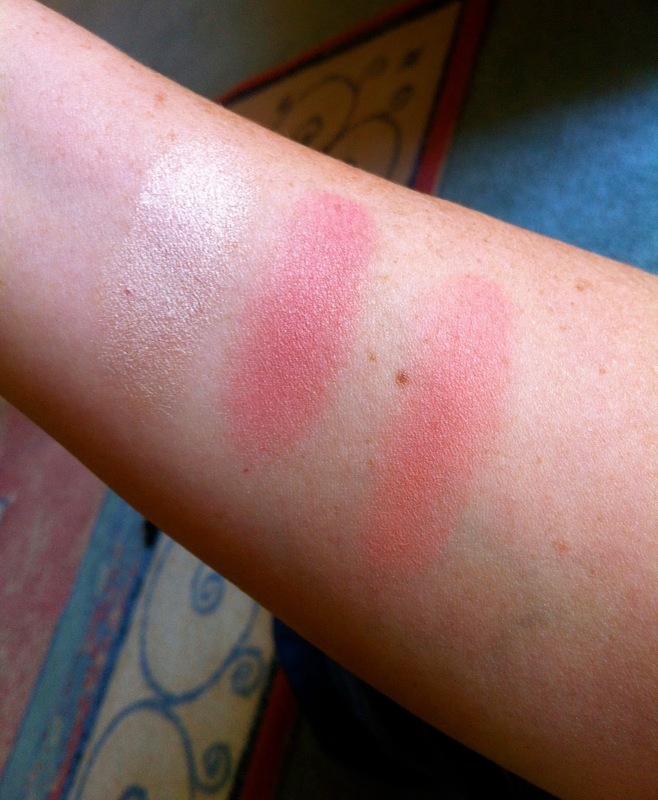 L-R The cream highlight, Night Owl Blush, and Modern Natural Blush. Two Pointed Eyeliner brushes were gifted with my order, I presume one per palette would be the standard. They remind me of the brush that comes with the Maybelline Gel liner pots, which I actually really like. Always happy to own another Real Techniques brush, and a free gift with purchase is always appreciated! I will spend the next few weeks playing with these, and will try to upload a few looks at a later date. As I mentioned, this is not a full review, just me sharing my initial thoughts with you. So far, it is only the lip glosses that are a little disappointing for me, but to be honest, the shadows and the face products are the reason I purchased these kits. Have you taken the plunge and purchased either of these? Are you holding off until you read some reviews? I know that some people do not like having both cream and powder products together in the same palette...does it bother you? Do let me know in the comments below!! Thanks so much for stopping by! I really appreciate everyone who takes the time to visit my blog, so thank you from the bottom of my heart! 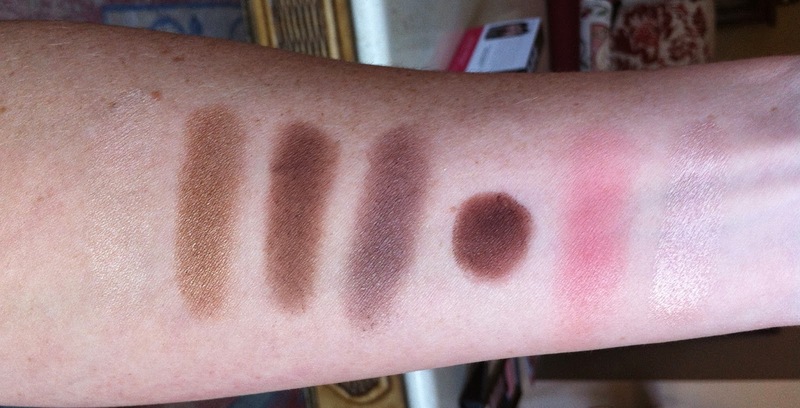 These are the best swatches I have seen of the two palettes so far!! I haven't ordered them just because I'm not a fan of online-only shopping, but I would love to check them out if they were launched in stores too. I've been a long time follower of the girls, I love their Real Techniques brushes and I don't think they would ever release a poor quality product. And you are GORGEOUS, I'm already a big fan! !